Here’s another forgotten tarot classic. This “Yes-No Oracle” is by Irys Vorel in an article entitled “How the Gypsies Use the Tarot” from the February 1955 issue of Fate Magazine. A version of this spread, expanded greatly by me, is now available at the commercial site Tarot.com. Check it out. 1. Write your problem or question on a piece of paper in such a fashion that “yes” or “no” could be the answer. Don’t ask ambiguous questions like “Should I marry Rick or Jason?” Situations such as this should be split into two questions. 2. Remove the Wheel of Fortune from the 78 card deck and place it before you face up. 3. Shuffle the rest of the deck, with your mind on the problem. Spread the cards in a fan, face down. With your left hand, draw seven cards at random. Put them face down on top of the Wheel. Set the remaining deck aside. 4. Turn the Wheel of Fortune face down like the other seven cards. Shuffle these eight cards until you no longer know where the Wheel is. • Top Left: The 1st position (cards 1 & 5) signifies – YES. • Top Right: The 2nd position (cards 2 & 6) signifies – SOON. 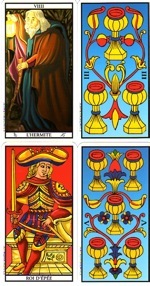 • Bottom Left: The 3rd position (cards 3 & 7) signifies – DELAY. 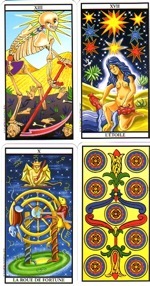 • Bottom Right: The 4th position (cards 4 & 8 ) signifies – NO. 6. Turn the cards over looking for the Wheel of Fortune. Its position gives you the answer. • If the Wheel card has fallen in the first position, it indicates “Yes,” and the speedy and favorable solution of one’s problem. • If it lies in the “Delay” position, the indications are that some obstacles will have to be overcome. • If it lies in the “No” position, it indicates adjustments have to be made and circumstances at the moment block the harmonious solution of the problem. Therefore, the wish cannot be fulfilled immediately. After changes have occurred this same wish could be answered in the affirmative. • Many Pentacles indicate a financial hitch. • Wands suggest journeys and changes. • Many Cups indicate fortunate circumstances and ultimately a happy ending, especially if the Grail [Ace of Cups] is among them. • Many Major Arcana indicate that the situation is out of your hands: destiny is at work. • Many Court Cards indicate that the wishes of other people determine the outcome. This is not my favorite kind of spread as it seems too deterministic, but it’s worth checking out to see if it works for you. Let me know what you think. Sample reading: Should I post this spread on my blog? We can see that the answer is “No” (the Wheel of Fortune is in the bottom-right pair), but I decided to post it anyway. How else can we determine if the advice is good or not? There are three Major Arcana (in addition to the Wheel) indicating that the situation is in the hands of destiny, and two Cups cards, which slightly leans toward a favorable outcome over the long run. I’ll let you know if anything untoward occurs. The deck used is Le Grand Tarot Universel by Bruno de Nys. While the Wheel card came up in the No position, which, according to this method (strictly followed) would suggest not posting, one might look to the Yes position with the Hermit and 3 of Cups and think that this is something that might be able to be used by someone for themselves (a solitary situation) to satisfying effect, but that it is perhaps not necessarily recommended to be used with others. I LOVE how you posted this anyway. I am strong willed that way too. But in a good way, right? The instructions did not include any suggestions for reading the individual cards in the spread but, of course, how could one not try to make sense of them! 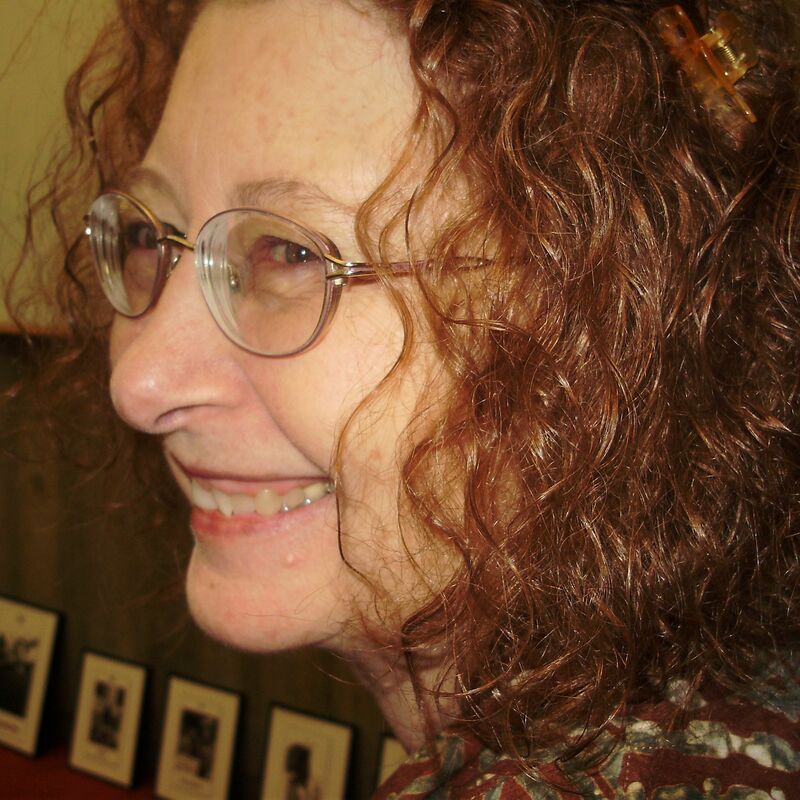 Susan – I hope it’s in a good way. Still, I gotta try. Pedro – You really think the tarot was that devious? Humm. That would make me suspicious of all its answers. Good question about any circumstance that would make me not post it. I did consider copyright issues. However, it would be silly for someone to publish a spread they never wanted anyone else to ever mention (particularly when giving the correct source info). Not sure I’d like this spread because it is too involved. LOL I like spreads that make me examine why I do things. I think I agree with you about deterministic spreads. I’d love it if you had time to take a look at a spread I just put up on my blog. I literally designed it last night so there is some tweaking that may yet occur. Yes, that’s the kind of spread I prefer for myself. I first learned to create spreads to help elucidate a personal issue from Gail Fairfield’s Choice-Centered Tarot (1981). She suggests going through precisely the same process you did: turn the questions you have about a situation into positions in the spread with the intent of gaining personal insight into your own process. The idea is to see what you can learn that will explore options and help you make choices that augment your own growth and well-being and are in alignment with your own values. For Gail, each querent and situation called for a unique spread to be devised, although she offered a list of basic spread positions that might come in handy. “What do I gain from . . .? “How do I honor . . .? “How do I nourish . . .? “What does _____ need from me? “What do I need to know about . . .? These are core questions for a very different kind of reading then the “gypsy” layout presented by Irys Vorel. However, there might be a time when you just want to see what the tarot has to say in terms of Yes, Soon, Delay and No. I really like Gail’s work and need to revisit it. It’s been years since I read it and it is one that deserves rereading. Thanks for the response. I do appreciate it. How about – you shouldn’t have posted it because Chanah has no money just now but she dearly loves beautifully coloured Marseille decks (not quite to the level of the radioactive gold background in the Rodés-Sanchez, but still, colour is good), and now she really wants this deck and can’t afford it? Very silly, I realise that. Or perhaps Monsieur Lys will be suddenly so overwhelmed with orders that he cannot keep up. Nice spread, though, and I think I may give it a whirl with the Tarot d’Eltynne, which is a redesigned Oracle Belline. It’s not a tarot, but it does have a Fortune (Hasard) card. It seems the spread might be suited to oracular use. Chanah – That’s how I felt when I first saw Le Grand Tarot Universel on the net. It has a little bit of the kids comic book feel to it which is so different from the paradoxically crude elegance of the typical Marseille. Some of the faces are kinda silly, but I find that I smile whenever I use it and enjoy the experience in a playful kind of way. Let us know how the Tarot d’Eltynne works. I’ve made a page for it. And posting here to verify the date. I shall definitely let you know how it works, and thank you for the spread! 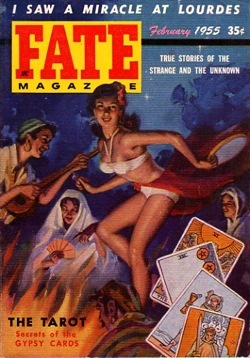 The Fate article was published in 1955. Some 2 to 3 years later I started to learn to read the Tarot. I was taught never to apply questions that revolved around the querent’s free will to any Yes/No spread. In the question you have asked, the onus is on you – “Should I . . .” Yes/No spreads, I was told, were for events one had no control over. That the writer of the article had something like this in mind is suggested by the use of expressions like “the wish cannot be fulfilled immediately”. If Jason proposed to the querent, her question to the Tarot wouldn’t be “Will my wish to marry Jason be fulfilled?” All she has to do is say yes! But if there were to be redundancies at her place of work, she might well ask, “Will I be made redundant?” as that is a decision that will be made for her. Knowing that the answer to her question was yes would allow the querent to start job hunting right away and to hopefully have no period of unemployment between leaving job A and starting job B. In short, there was a practical dynamic underlying the question. Since you say you considered copyright issues at the time you laid the spread, I took the liberty of recasting your question in the way I was taught to do and produced a spread of my own to answer it. The question I wrote down was: Will anything seriously damaging happen to MKG as a direct result of posting the entry about the Fate article on her blog? As you can see, the answer is no, as Trump 10 falls in the bottom right-hand quarter of the reading. I’m publishing this in a spirit of put-your-money-where-your-mouth-is, and we can now all sit back and see what happens! Tony – I like your distinctions. As I take it you are suggesting this spread is best for straight predictions and not for personal advice in issues over which the querent has control. However, given the examples, the author of the article clearly was thinking of advice spreads: “Should I . . . ?” As for predictions of events outside our control, I’ve experimented with these a lot in classes and, in general, find them to be the least reliable way to work with the tarot. This is an area for which scientific experiments could be easily arranged. It is my hope that someone with the background and credentials will take it on. Thanks for doing the spread. I’ll go with what your cards say. I prefer the simple yes/no spread described in your Complete Book of Tarot Reversals where you rely on upright (yes) or reversed (no) cards layed out in a straight line of three (or any odd number) combination. Is there a caveat to strictly following the advice given in this manner? I rarely (extremely rarely) allow yes/no questions in a professional reading. The few times I’ve ever done them with others, I’ve counseled that it’s main use is to help you clarify what you really want. Do you remember me? A woman who hosts a radio show asked me if you were still teaching. I googled you and found this AMAZING site! I would love to jump into this conversation about the box spread above. Often in a reading the Tarot will give me the opposite answer to that which I’m receiving from my own intuition. I’ve realized that the Tarot gives me clues and fills in the blanks to what I’ve left out from my intuitive hit. The Tarot never lies. I find that I can’t take the Tarot literally sometimes, and that it gives me so many layers of deeper meanings. In February, I’m teaching a course called, “Higher Vibrational Tarot”, for students who are interested in the vastness of what the Tarot can offer. How wonderful to hear from you. Of course I remember you. Regarding getting the “opposite response”: I’ve sometimes found that tarot takes us down paths that might not be the “right” one, but that are necessary in order to get TO the right one. How wondrous it all is. Yesterday, while watching Obama being sworn in, my husband commented about how he seemed to have some qualities that came from a high place of wisdom. A friend of mine once made the comment that Obama seemed to embody the Divine Feminine even better than Hillary Clinton. Of course I looked up Obama’s birthday. It is August 4th, 1961. Mary, if we refer to your book, Tarot Constellations, and we add up his numbers, his base number is 1973, and if we add those across, lo and behold, we have 20, 2. A High Priestess!!! Why am I not surprised? Thought I’d share this fun information. Kaira – Thanks for adding Barak Obama’s birth cards. However, it’s important to remember that Ronald Reagan was also a 20/2 (along with Elizabeth I, Henry Kissinger and John Travolta). The cards would say not to post it because the way they fall will disprove that this is an accurate spread. But posted it because it does prove that it is correct that you should not post. lol..its like a double negative equals and positive! Wait…I thought 3&7 were just a delay? I believe that by asking “Should I”, which is asking the Tarot to make the decision or you, you actually invalidated the results and got yourself what I call a “dead reading” thereby, since the tarot cannot tell you what you “should” do. Therefore, the “No” response, which seemingly makes no sense, actually isn’t a “No” response: there’s no information to give. Another way to look at this is that the guidance not to publish it came from the fact of using an invalid question, which would not produce a good example. In this case, the result would be what I call a “zombie reading” (living dead) in which the answer is valid, but there is no way to answer the question in the spirit in which it was asked. Shannon – This is not a predictive or descriptive spread but a prescriptive (i.e., advice) one. How would you phrase an advice question that can be answered with a yes or no? I’m really interested. If I understand you correctly, you are essentially objecting to this kind of spread as much as to the phrasing of the question — which is required for this spread to operate. If your problem is just with the question itself then we need an example of what kind of question you would use with this spread. I could certainly change the addressee and say, “Does my highest self (or Spirit) advise me to ____?” But, in my opinion, this doesn’t change the essential issue. For a long time I refused to do prescriptive readings, however I would occasionally break my own rule to see what happened. A few times I got messages that completely blew me away with their straightforward clarity that was exactly what was needed at the time. Personally, I liken this spread to flipping a coin (but with a few extra perks) and there are times when even flipping a coin is what is needed. Shannon, I don’t get your distinctions between a “dead reading” and a “zombie reading.” Would you clarify the difference? Nor do I understand why the question is “invalid” other than it being a question you don’t believe should be asked. amazing post, must say. I am a learner in this tarot world and stumbled on ur blog and got this spread and cant wait to use it. I like this type of spread, though I wouldn’t choose to use it a lot, I do like it. I love the idea of the different quadrants of the square to signify different meanings. I will try it! You asked what “soon” means. I interpret it as “a possible yes” but “not yet.” Also, I try to be open to the possibility that the situation would not quite work out as I had envisioned it at the moment of the initial reading. Time creates its own variations on things. Mostly, it seems to be saying not to try and force an issue prematurely, but let it work itself out. I have been using this spread for almost 20 days now and its bang on target! Thanks for sharing the great spread! What a wonderful post, and fabulous, entertaining and educative dialogue out here, Mary. I was directed to this by a hotlink in a recent mailout from Corrine Kenner, who tested the layout with her group. I shall now proceed to do the same with my group. I like Yes/No spreads as a practical application for those deciding whether or not such processes even work, or work reliably. I do not care for them, but in the spirit of inquiry and comparison with results, I use them often. I am always curious to compare outcomes with predictions and counsel from the cards. I think that review is central to the work, and so I love a new spread to share with my students and associates. Thank you so much, and all your readers, and Corrine, for alerting me to this. By the by, the deck is simply a knockout. I could feel myself wanting to make an immediate impulse purchase. I have Amazon Prime and so do not pay for shipping, and all arrives within 2 days, so it is horrible temptation. I prefer to buy from The Tarot Garden anyway. But…… this deck simply demands to be owned. Truly. Oh, I see that this deck is not so easily available, thank heaven, ha ha! I appreciate the link and will review the site. It pays to know people who know practically everything about the Tarot, LOL! How can I use ordinary playing card to predict yes or No Question? The most traditional way to use regular playing cards to predict yes/no answers is by playing solitaire. If you win then the answer is yes, if not, then the answer is no. Of course, you’ll want a solitaire game where the odds are pretty close to 50-50. Standard Klondike but where you go through the stack one-by-one as many times as necessary is probably one of the closest. Playing card historians seem pretty convinced that solitaire may have originally been a fortune-telling method based on the fact that it is called Reussite (success) in France and Kabal in Eastern Europe, plus early descriptions of the games say that you should make a wish and see if it will come true via the results of the game. I believe that the “Yes” or “No” spread is very good and can answer your question.However, I have another suggestion that gives me more details. I prefer to share all the cards in the four possitions until the Wheel of Fortune apears in one of them. Next step, is to take the pile with the wheel of furtune, and spread it on the table in circular shape, following the cards as the are. After, I count the numerical values of the cards, starting with the Wheel of Fortune (until I repeat a card). Through this system I have the story and the “yes” or “no” answer. This method follows the numerical system of the Golden Dawn. Note: some times the “Yes” story can arrive through a bad situation. Othertimes, the “No” story comes after a good story. For example, ‘Wheel of fortune’ – ‘6 of sword’- ‘2 of cups’, may be an interesting trip where you meet a belaved person , but be also a bad tuning for your purpose. Thanks for the interesting variation on this process. What I think you are saying is that you deal out the entire deck, then look for which pile has the Wheel of Fortune, which determines the basic answer. You then spread out the cards from that pile and count the cards using the Golden Dawn counting technique (see ‘Opening of the Key’) to determine which cards from that group you need to read for more information. You are right, I look also the other piles and specificaly the last card on top of each. However, I am not sure if I should interpret them as hypothetical or drastical. Tarot Transformation is the British edition of Tarot for Your Self. I’m glad you liked it. The results with this, more than most forms of divination, needs to be considered carefully. Because it is couched in terms of advice – should’s – one needs to remember that the advice at one moment may not have the same consequences as soon as even one factor changes. I always take it with a grain of salt, like the advice of a friend who may not have all the information or have their own agenda. I still have to make my own choices. BTW, the version that I wrote for tarot.com includes quite a few additional interpretative elements not mentioned in the original spread description. I use the spread to ask a question about myself, that I already knew the answer to. I was very impress with the Wheel of Fortune card being read from the upper left hand position 1. For a very firm yes to my question. I will use this spread for now on to my yes or no questions. Thank you very much for the knowledge. I’m glad you published it. 🙂 I am always into learning new spreads. Thank you. I’ve just started using this spread and I’ve found it very useful so far. In top left I have 8 of cups and ace of cups! in the bottom right I have 7 of wands and 6 of wands! Sorry, but my blog is not a place for tarot consultations. Exucuse me, can i ask some questions not begin eith “Should I” with this spread? Windypeco – This is a yes/no advice spread. You can phrase your question in any way you wish as long as the four possible answers make sense to you. Reblogged this on One thousand things and one. Reblogged this on ♔Cinderella's Memo✧. When you shuffled the cards and asked the question, had you already decided that you would create a blog entry for this reading? If so, perhaps it was your own subconscious mind that answered you in this fashion, just to give you a (small) lesson for being willing to be willfully contrary? I.e. No matter what the cards present, I’m going to do it, anyway! BTW: For a simple YES/NO answer, what could be more succinct and more accurate than the “toss of a coin”? Surely, a wonderful tool for divining straightforward questions, where no elucidation is required? I read this as Bottom Left: The 3rd position (cards 3 & 7) signifies – DELAY. The cards are 1, 2, 3, 4 on top and 5,6, 7, 8. on bottom. then the 3 is Death and 7 is Wheel of Fortune. So this is a delay. How do you see it as a no? I do think asking a yes/no question is asking the Tarot to be responsible and not you. However, I like for myself to play with this thought and I love this spread! Thank you! The Wheel came up in the bottom-right section. Personally I only use Yes-No questions to gather more information about how I really feel about a situation. Hi Mary thank yous o much for sharing this yes or no spread. I tried it for three different questions and the Wheel has always turned up at positions 2-6 does this mean soon? or yes-maybe? Is there something I should do to move it along to a “yes” only or just the advice it to take precaution, since you mention “You should not unduly press your interests.” so should I just sit back and wait for it? Sorry I’m just so confused. Trying to understand the 2-6 “soon” position. I’m glad that you post this spread, regardless the “no”. As I am relatively new to reading tarot and still trying to get my head around it, I found that this spread is something that I can try on. So, indeed your decision to post it came to a good outcome for someone who is nee to tart, like me. Thank you heaps! If you get a the wheel on yes, however the card next to it is the eight of swords, would it be considered a no?